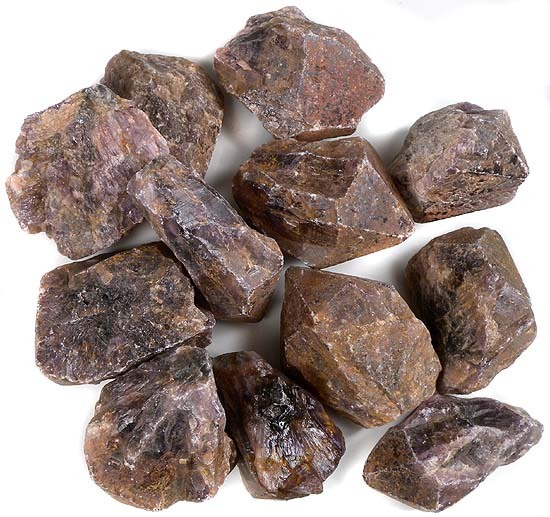 Cacoxenite is a wide rutile crystal that form in quartz. In these stones, the cacoxenite is inside of amethyst, which makes for strikingly beautiful stones with glowing gold inside of transparent to translucent purple amethyst. 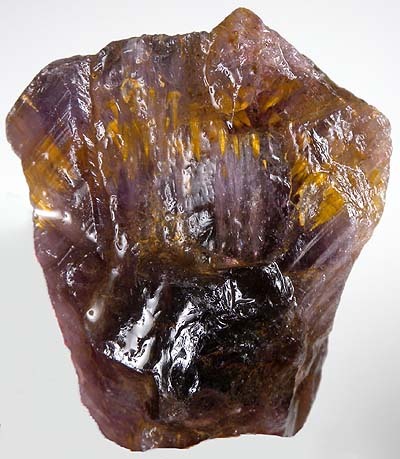 Cacoxenite in Amethyst comes from one locality in Minas Gerias, Brazil and was mostly mined out years ago. This material is also referred to as "Super Seven" by some people, but the proper name is Cacoxenite in Amethyst. As with all quartz species, Cacoxenite in Amethyst polishes well with tin and cerium oxides. Each crystal is approximately 2" long, or more! Close up of rough Cacoxenite in Amethyst crystal. Finished stones cut from Cacoxenite in Amethyst. Measures approximately 2" x 1-3/4" x 1-1/2" thick. Measures approximately 2-1/2" x 1-1/2" x 1" at the thickest point. Measures approximately 2-3/4" x 1-1/2" x 1-1/4" thick. Measures approximately 2" x 1-1/8" x 1" thick. Measures approximately 2-3/4" x 1-7/8" x 1-7/32" thick. Measures approximately 2-3/4 " x 1-1/2" x 1-1/2" thick.